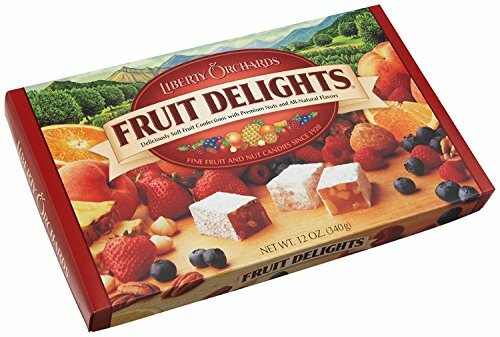 Gift box of Liberty Orchard's popular 6-flavor assortment! Know someone who likes to try a little bit of everything? Their eyes will widen with delight when they open a colorful box of our Fruit Delights candies! Each of our tempting flavors are distinctively different, but so equally delicious they might have a hard time choosing a favorite. They're sure to love all six orchard-fresh varieties: slow-simmered Strawberry-Walnut, marmalade style Orange-Walnut, cool mountain Blueberry-Pecan, sweet island Pineapple-Macadamia, tangy ripe Raspberry-Pecan, and summer-fresh Peach-Walnut. Kosher. If you have any questions about this product by Liberty Orchards, contact us by completing and submitting the form below. If you are looking for a specif part number, please include it with your message.